(from left to right) Tony Leung Ka-Fai, Cheung Man, Jacky Cheung and Maggie Cheung. The Skinny: This all-star wacky wuxia is questionably funny, though it does have its share of fun action sequences and amusing star turns. Screwy wuxia from the two of the most tasteless talents in Asia: Wong Jing and Chiu Yen-Ping. Tony Leung Ka-Fai stars as Chung, the "Big Dagger" of the "Big and Little Flying Dagger" team. The other member is Lam, played by ultra-cute Taiwanese popstar Jimmy Lin. They're bounty hunters who are after jiang hu bad guys, and are entreated to capture Nine Tails Fox (Jacky Cheung), a rascally scoundrel who supposedly rapes and pillages. 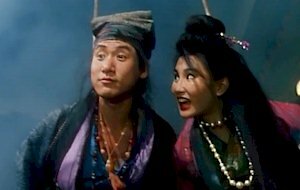 Our heroes also have competition, namely "Big and Little Betwitchment", played fittingly by Cheung Man and Gloria Yip, which means romantic shtick and sexual innuendo aplenty. Nine Tails Fox is also somewhat randy himself, which leads to fight sequences in a brothel and the use of aphrodisiac as a weapon. Fox also has "farting" powers and multiple furry tails (hence the "Nine Tails" name), and is married to Flying Cat, who looks like a woman but acts like a cat. Played enthusiastically by Maggie Cheung, Flying Cat screeches, yowls and climbs trees with abandon. She also gets off on one of the bad guys licking her face, which is a good representation of the film's sense of humor. Flying Dagger isn't art, that's for sure. Then again, expecting art from Chiu Yen-Ping and Wong Jing would be like expecting Disney to respect the rights and cultures of others; basically, it just isn't going to happen. Thankfully, Flying Dagger's extreme amounts of comedy - while predominantly unfunny - aren't gratingly annoying like some similar films (think Holy Weapon), and there are occasional moments where the humor really works. This is probably due to the silly antics of HK Cinema luminaries Tony Leung Ka-Fai, Jacky Cheung and Maggie Cheung. No one here is above embarassing themselves for their paying audience (or possibly their own paychecks), and their game performances prove enjoyable. Notes:  In this film, you will find music lifted from the following films: Death Becomes Her, Quigley Down Under, A Fish Called Wanda, and Heathers. Not content with stealing ideas, the fine people behind this film have decided to steal whole soundtracks.